Join Summit Ministries' Dr. Jeff Myers—with renowned Bible teachers Del Tackett, Sean McDowell, John Stonestreet, Virginia Prodan, Glenn Packiam, Alan Shlemon, and many others—on a fascinating journey exploring today’s worldviews and what they say about life's biggest questions. Based on Summit Ministries' 55 years of research and experience with tens of thousands of Christians on the topic of shaping a Biblical worldview, The Secret Battle of Ideas about God will help you, your family, and your church overcome dangerous worldviews and stand firm with a solid Biblical foundation. This easy to take survey will help you, your church, or your family identify how the five fatal worldviews have made their way into your worldview. "We're all in the fight: Secret Battle is a combat manual for winning." Don't let dangerous ideas destroy your faith. 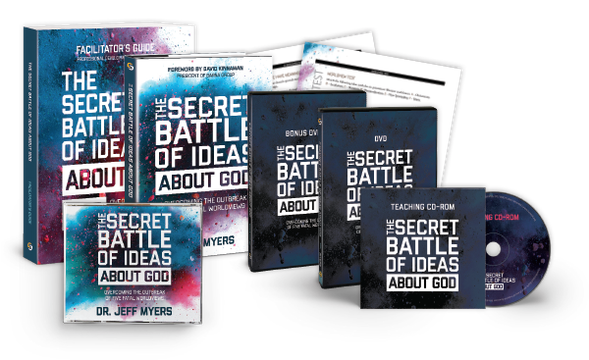 The Secret Battle of Ideas About God church kit will equip your church members to defend themselves against the dangerous idea viruses of fatal worldviews. ​small groups, or for individual use. ​answers of life's biggest questions. ​Secret Battle of Ideas About God ​samples. Order from your favorite retailer today! Do you work at a Christian school? Learn how your school can use The Secret Battle of Ideas About God Professional Development course. As an authority on Christian worldview and apologetics, Dr. Jeff Myers teaches Christians how to understand what they believe, why they believe it, and how to defend it against fatal worldviews. Over the last 20 years, Dr. Jeff Myers has become one of America’s most respected authorities on Christian worldview, apologetics, and youth leadership development. He’s the author of several books and the president of Summit Ministries. Dr. Myers teaches at College Plus and Belhaven University, and lives in Colorado with his family.